Pune – a metropolis surrounded by lush green hills and pleasant weather, was once the heart of the Maratha Empire as the Peshwas resided here and today, it’s known as the ‘Oxford of the East’ due to its numerous education institutes. Pune is also best-known for it’s food and cafes. 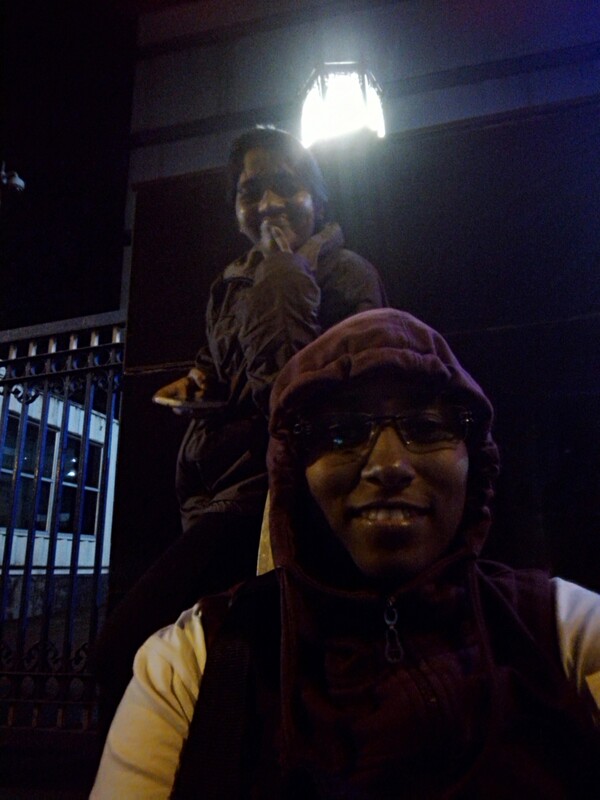 20.30 hrs – The bus reached Shivaji Nagar Railway station and we started walking towards a restaurant for having our dinner when Mythri stopped at a pani-puri wala 🙂 . One of the most popular street foods all over India – Pani Puri (called Puchkas in Bengal and golgappe in Punjab). Puris are puffed, hollow dough balls, fried to a light crispiness and filled with a masala of cooked potatoes, peas or chickpeas, and served with pani (water), a sweet and sour, tangy chutney made with tamarind or coriander. We had 5 puris each and walked towards the restaurant. The first question we asked the waiter is whether they gonna accept debit cards, and the answer was instant, they do 🙂 . We ordered for some jeera rice, aloo mattar and vegetable raitha as well as some coke. Food tastes better with coke :-p . During our train journey from Lonavala to Pune, Mythri booked our bus tickets to Shirdi, while waiting for the food, I reserved a room for us at Shirdi. Online made everything easy. Thanks to red bus and make my trip 🙂 . We have to kill sometime as our bus is only at 22.30 hrs. Thanks to the waiter, as they served our food a bit late, so that the pani puris which we had earlier would have occupied a corner in our stomachs and we can fill the remaining with the food we ordered 😀 . The food arrived and we ate at a much lesser pace so that we can sit for more time there 😀 . 21.40 hrs – We finally made a move towards our boarding point which is like a 10 min walk from the restaurant. 22.00 hrs – I made a call to the bus driver to just make sure that we were at the right place waiting for the bus. The bus driver asked us to come to another pick-up point which is like another 5 mins from the point where we were waiting. 22.40 hrs – Boarded the bus to Shiridi, our next destination. Settled down with a blanket covering our faces, I didn’t even notice when our bus moved off 🙂 . A long day.. Wasn’t it?? This entry was posted in Masti in Maharashtra and tagged food, Lonavala, Maharashtra, Oxford of the East, pani-puri, puchka, Pune, Shirdi. Bookmark the permalink.